Since 6th April 2013 and in line with the introduction of RTI, employers are no longer required to submit a P45 to HMRC when an employee leaves their employment. Instead, HMRC will be notified of an employee leaving in the last Full Payment Submission you send for that employee. With this, the employee’s leave date must therefore be entered before their final pay period is finalised, so that the date of leaving is included in the Full Payment Submission in the period they are last being paid in. 1) Within Payroll, select the employee from the listing. 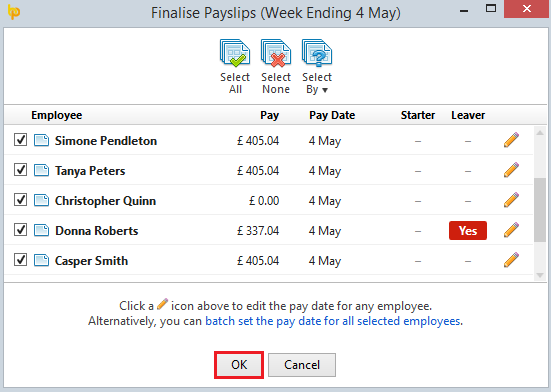 2) Enter the employee's final pay and select Finalise Payslips on the menu toolbar. 3) Before selecting 'OK', click the ‘Edit’ button next to the employee’s name and enter the employee’s Leave Date. Click ‘Save’. The ‘Leaver’ indicator will now show next to the employee’s name. 4) When it displays leaver "yes" click 'OK' to finalise the employee's payslip. On finalising the employee’s payslip, the corresponding Full Payment Submission will notify HMRC that the employee has now left your employment. Once an employee’s leave date has been entered in BrightPay, they will no longer be included in any subsequent payroll period. The employee’s payslip history, however, will remain should this need to be viewed at any time. Please note, as soon as an employee leaves your employment, a P45 should still be printed and given to them for their own records. 1) Within Employees, select the employee from the listing. 2) Select P45 on their menu toolbar. 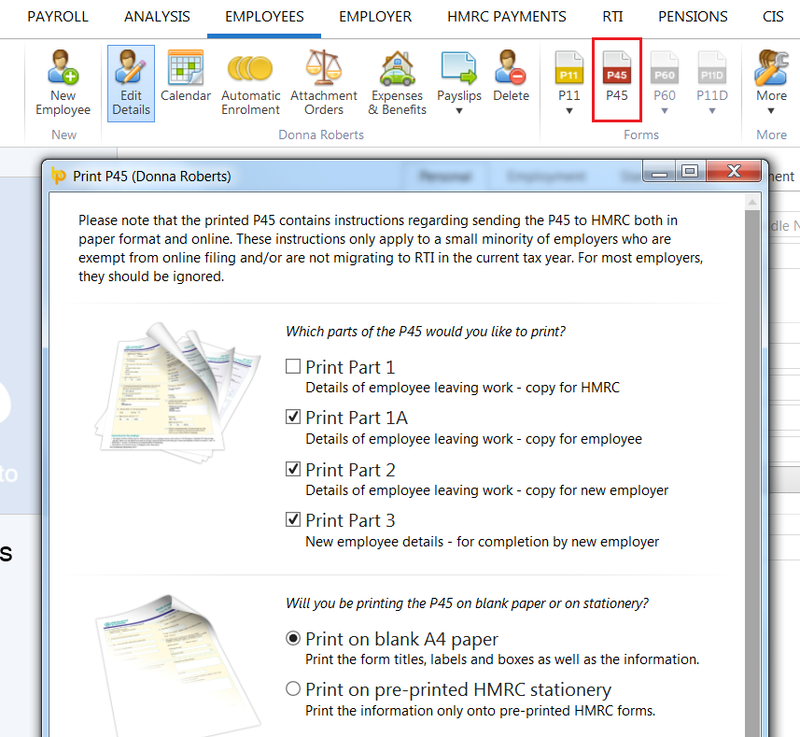 3) Select which parts of the P45 you wish to print and click Print Preview, followed by Print. Parts 1A, 2 and 3 can be printed for the employee as well as a copy of Part 1 for the employer to keep on file. If the P45 option is greyed out in the employee record after entering the employee's leave date, this usually means that the pay period in which the leave date is falling is still 'open' and has yet to be finalised within the Payroll utility. Simply check the leave date, and then within the Payroll utility, establish the pay period in which this leave date falls. Is the payslip in which the leave date falls still open for the employee? If so, simply finalise this payslip accordingly and the P45 button should then be visible for you within the employee's record.